The third installment of He Was On That Team? looks back at the NBA in the time of 1996-1997 Detroit Pistons and the greatness of Grant Hill. In this ongoing series, Matt Domino looks at an NBA roster from a specific season and tries to put the team's story into context with the larger NBA landscape at the given time period. Of course, he will always throw in a personal anecdote where applicable as well. The 1996-1997 Detroit Pistons won 54 games and lost 28, which would have been a fantastic record during any other season in the league. Unfortunately, the 1996-1997 season was when the NBA began it’s watered-down, downward trend in talent that would become much more noticeable once Michael Jordan retired after the 1997-1998 season*. Because of this fact, the Chicago Bulls finished with 69 wins, the Utah Jazz with 64 wins, the Miami Heat with 61, and the Knicks and Hawks with 57 and 56. So, for historical context, a Pistons team that would most likely have the second or third seed in the upcoming 2013 Playoffs, entered the 1997 Playoffs as the fifth seed. The league was in a strange place in 1996-1997. The Bulls resumed their decade of dominance as Jordan watched most of his early rivals begin fade and grow old, while simultaneously welcoming a score of new up-and-comers that had developed their games in his looming, Jumpman shadow. In the 1996 Draft alone the NBA added the following players into the league: (in order of when they were drafted) Allen Iverson, Marcus Camby, Shareef Abdur-Rahim (deep cut! ), Stephon Marbury, Ray Allen, Antoine Walker, Kerry Kittles, Erick Dampier, Kobe Bryant, Peja Stojakovic, Steve Nash, Tony Delk, John Wallace (where my Knicks fans at? ), Derek Fisher, Othella Harrington, Jeff McInnis, Shandon Anderson, Chucky Atkins, and Ben Wallace*. That’s a pretty decent haul for one draft. However, not every year’s draft was that overflowing with talent. Well, we know that Jordan retired, the league had a lock-out and the watered down talent level allowed teams like the Lakers and Spurs to run roughshod over a weak league from 1999-2007 (with a few breaks in between). However, we didn’t know any of that in 1996-1997 and in many ways the Detroit Pistons of that year were the perfect representation of where the NBA was and where it was heading. Obviously, the team was centered around Grant Hill—who was 24 years old, entering his third season, already a two-time All-Star and who had led the league in All-Star voting (beating even Michael Jordan) the season before—as well as third year point guard Lindsey Hunter who the Pistons front office hoped would continue the backcourt glory days of Joe Dumars and Isiah Thomas. 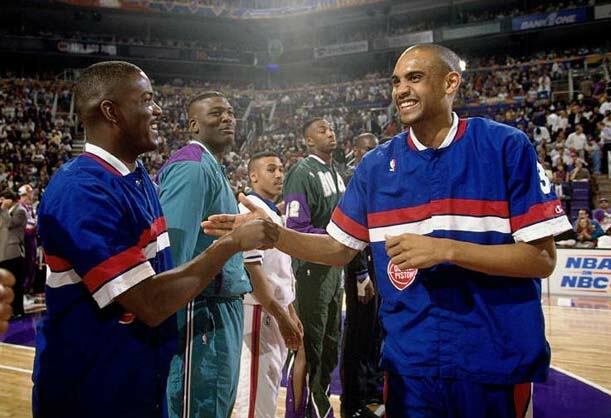 In fact, the actual Joe Dumars was on the team as well, fading gracefully into the twilight of his Hall of Fame career. To start the season, Dumars was joined by fellow veterans, and former NBA champions with the Houston Rockets, Kenny Smith (yes, TNT’s Kenny Smith), and Otis Thorpe. Finally, the Pistons were banking on young and promising big man, Theo Ratliff, who was not yet a salary cap joke. 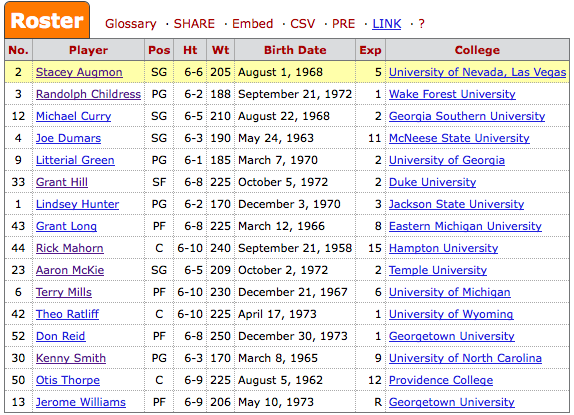 Just looking at that roster, you can see the divide that was spreading across the NBA as a whole. A generation of late-80’s and early 90’s stars was on their way out of the league, while a whole new crop of young players were looking to make good on their talent and the league’s (and the entire nation’s) widespread affluence. However, besides Grant Hill, there wasn’t a true, marketable super-star on the entire team. The Pistons were crossing their fingers on players like Hunter and Ratliff, while preparing to say farewell to one of the most popular players in the franchise’s history in Dumars. And make no mistake, Grant Hill was a superstar. As Hill struggles to find minutes off the bench on the 2012-2013 Clippers as a 40 year old defensive stopper looking for one more chance at an NBA Title, it’s easy to forget just how transcendent of a player he was before he suffered a series ankle injuries that eventually lead to major surgery. From 2000-2007, Hill played in 200 out of a possible 574 games, essentially robbing him, the league and the fans of nearly the entirety of his basketball peak. Before Hill’s injuries, though, he was nothing short of phenomenal. Looking back at Hill’s body type and game, he was some kind of cross between Scottie Pippen and a prototype for Lebron James. Hill was 6’8 and played at an average weight of 220-225 pounds. Athletically, he was explosive and as a player, he was generous. He could score with anyone and could pass the ball like a point guard (he played “point forward” much like Pippen did on the Bulls and how Lebron does now), and was an above average defender. During the mid-90’s perhaps behind only Jordan and Pippen, Grant Hill was the best “all around” player in the entire NBA. In 1994-1995, his rookie season, Hill averaged 19.9 points, 6.4 rebounds, 5.0 assists, and 1.8 steals. The following year, he averaged 20.2 points, 9.8 rebounds, 6.9 assists and 1.3 steals, raising his numbers in almost every category. The 1996-1997 season, was perhaps his best all-around season, as he averaged 21.4 points, 9.0 rebounds, 7.3 assists and 1.8 steals—the scoring is a little lower, but those numbers are very similar to the kind of game Lebron is playing night in and night out this season. During the 1996-1997 season, the Pistons got off to a blistering 20-4 start with Hill routinely doing things like this and this to opposing teams. However, they only went 34-24 over the rest of the season. A variety of factors played into this fact, the main one being that the team was fairly mediocre and were playing over their heads in the beginning of the season. The second had to do with roster change-ups as Kenny Smith was traded after nine games and the Pistons added pieces such as veteran Stacey Augmon, another promising young player in Aaron McKie, and old (at this point, very old) ex-Bad Boy Rick Mahorn mid-way through the season. Finally, Doug Collins was the coach and has a track record of wearing on his teams. This was his second season in charge and he was probably starting to grate on the players as the year went along. The Pistons made the Playoffs as the fifth seed in the Eastern Conference and were matched up against the fourth-seeded Atlanta Hawks, who fielded their own fairly mediocre team that season with Steve Smith, Christian Laettner, Mookie Blaylock and Dikembe Mutombo as their only notable players. Detroit lost the series in five games, though Hill raised his scoring (21.4 to 23.6 points per game) throughout the entire series, as did Lindsey Hunter (14.2 to 15.0). Though the Pistons appeared to be a team to reckon with in the late-90’s—that didn’t happen. The next season, the Pistons added the talented Jerry Stackhouse to the team, but the roster never truly meshed. The team finished 37-45 and fired Doug Collins after 45 games. Long term, though Stackhouse would provide a viable second scoring option to Hill, Hunter never truly proved to be the answer at point guard and the team could not find a true low post presence to balance out the lineup. During Hill’s final season with the team in 1999-2000, he increased his scoring to 25.8 points per game—though his rebounding was down to 6.6 per game and assists down to 5.2—while Stackhouse put in 23.6 points per game. Despite having dual 20ppg scorers, the Pistons finished as the seventh seed in the Eastern Conference and were swept by the Miami Heat in the first round of the Playoffs. During the off-season, Hill signed with the Magic and his battle with ankle injuries started*. After Hill nearly died due to a fever following one of his surgeries, he slowly made his way back to health. He played in 67 games during the 2004-2005 season for Orlando and averaged 20.3 points, 4.9 rebounds and 3.4 assists. However, the following year he was injured again and played in only 21 games. After the 2006-2007 season, Hill contemplated retiring, but instead decided to sign with Phoenix to play with Steve Nash and the legendary Phoenix Suns training staff. In Phoenix, Hill re-invented himself as a defensive stopper. He became a poor man’s Scottie Pippen, which for him, at that stage of his career and after all of the physical trauma he had gone through over the years, was pretty remarkable. In his five years in Phoenix, Hill averaged 14.3 points, 5.4 rebounds and 2.9 assists per game. Hill always seemed to find a way to contribute, especially during Phoenix’s remarkable run to the 2010 Western Conference Finals where they lost in an epic six game series against the Lakers. A series that Phoenix could have won if Kobe didn’t play out of his mind (he averaged 33.6 points that series!) and if Ron Artest didn’t make his miraculous put-back in Game 5. The Clippers probably won’t win the NBA Title this year and I am guessing that Grant Hill will retire without a championship—no matter how much I hope I’m wrong about that fact. However, I’m glad that I can still look back at a roster from the mid-90’s Detroit Pistons and remember just how great Grant Hill was; and how despite his injuries, he has still found ways to channel that greatness into new roles for whatever team he is currently on. How he has remained one of the league’s most revered spokespeople. That former athletic greatness may have faded and been taken away from Hill, but his overall excellence never was.